The African Union (AU) is a Assembly of the African Union, a semi-annual meeting of the heads of state and government of its member states. The AU's secretariat, the African Union Commission, is based in Addis Ababa, Ethiopia. The African Union is made up of both political and administrative bodies. The highest decision-making organ is the Assembly of the African Union, made up of all the heads of state or government of member states of the AU. The Assembly is chaired by Mohamed Ould Abdel Aziz, President of Mauritania. The AU also has a representative body, the Pan African Parliament, which consists of 265 members elected by the national legislatures of the AU member states. Its president is Bethel Nnaemeka Amadi. The African Union's new headquarters complex in Addis Ababa. ^ "African Union anthem, etc.". Africamasterweb.com. Retrieved 26 November 2012. ^ "Report for Selected Country Groups and Subjects". IMF. 14 September 2006. Retrieved 26 November 2012. ^ "Report for Selected Countries and Subjects". IMF. 14 September 2006. Retrieved 26 November 2012. ^ Thabo Mbeki (9 July 2002). "Launch of the African Union, 9 July 2002: Address by the chairperson of the AU, President Thabo Mbeki". ABSA Stadium, Durban, South Africa: africa-union.org. Retrieved 8 February 2009. 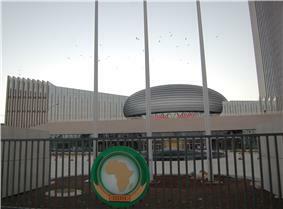 ^ Press release No 13 / 18th AU Summit : Inauguration of the new African Union Conference Center. Directorate of Information and Communication. African Union Commission (28 January 2012). ^ Linyan, Wang. "New headquarters shows partnership entering era of hope: Ethiopia PM". ^ "AU Member States". African Union. Retrieved 30 January 2013. ^ Dixon, Robyn (25 March 2013). "African Union suspends Central African Republic after coup". ^ "Haiti – Diplomacy: Haiti becomes a member of the African Union – HaitiLibre.com, Haiti News, The haitian people's voice". Haitilibre.com. Retrieved 26 November 2012. ^ "Kazakhstan was granted an observer status in the African Union". ^ "Latvia becomes observer to African Union". ^ Fathya el-Dakhakhni (27 May 2013). "AU grants Palestine observer status". ^ "Mrkić na samitu u Adis Abebi". ^ "Serbian FM urges African Union support". ^ "Press Release Regarding The Participation Of H.e. Mr. Bekir Bozdağ, Deputy Prime Minister Of The Republic Of Turkey, In The 18th Ordinary Session Of The Assembly Of The African Union". ^ BBC News (8 July 2001) – "OAU considers Morocco readmission". Retrieved 9 July 2006. ^ "Kenya pushing for African split from International Criminal Court". ^ Pan-Africanism and the African Union, Dallas L. Browne. ^ See Towards a People-Driven African Union: Current Obstacles and New Opportunities, AfriMAP, AFRODAD and Oxfam GB, Updated Edition November 2007, pp.45–46, and Strengthening Popular Participation in the African Union: A Guide to AU Structures and Processes, AfriMAP and Oxfam GB, 2010, pp.8–9. ^ "African Union urges restraint on both sides". The Star. 21 March 2011. Retrieved 5 July 2011. ^ Mulondo, Emmanuel (21 March 2011). "Kutesa, AU blocked from entering Libya". ^ "Rupiah backs action against Libya". The Post. 27 March 2011. Retrieved 5 April 2011. ^ "Arab League Recognizes Libyan Rebel Council". ^ "Tunis recognizes Libyan rebels as country's rep". Seattle Post-Intelligencer. 20 August 2011. Retrieved 20 August 2011. ^ "Egypt recognises Libya rebel government". ^ "Ethiopia recognizes Libyan rebels". NOW Lebanon. 24 August 2011. Retrieved 24 August 2011. ^ "Libya-NTC: National Transitional Council in Libya". Afrique en ligne. 27 August 2011. Retrieved 27 August 2011. ^ "Benin recognize Libyan rebels". ^ "Algeria declines to recognize Libyan rebels". NOW Lebanon. 26 August 2011. Retrieved 26 August 2011. ^ "Libyan envoy to Zimbabwe expelled for burning flag". The Zimbabwean. 26 August 2011. Retrieved 26 August. ^ "African Union officially recognises Libya's new leadership". ^ a b Bernadette Schulz, Ruth Langer, "Peace missions - The long haul", D+C, 27 August 2013. ^ "All is rather easily forgiven". ^ "'"AU denounces Togo 'military coup. ^ "'"AU Darfur mission 'to end soon. BBC News. 28 June 2006. Retrieved 23 April 2010. ^ "Security Council Authorises Deployment of United Nations-African Union 'Hybrid' Peace Operation in Bid To Resolve Darfur Conflict". United Nations. Retrieved 26 November 2012. ^ Sulaiman, Abubkar o.; Agoha, Ifeanyi Chuckwu (1 October 2013). "South Sudan Negotiated Independence: A Critique of African Union’s Role". European Journal of Sustainable Development 2 (3): 145–154. ^ Protocol on Amendments to the Constitutive Act of the African Union: Article 11, Official Languages. ^ "Ethiopia: AU Launches 2006 As Year of African Languages". ^ According to the AU, his official style is Son Excellence Obiang Nguema Mbasogo, Président de la République, Chef de l'État et Président Fondateur du Parti Démocratique de Guinée Equatoriale (French). Retrieved 4 October 2011. ^ a b c d e "World Development Indicators". ^ "Statistics | Human Development Reports (HDR) | United Nations Development Programme (UNDP)". Hdr.undp.org. Retrieved 17 November 2011. ^ "Failed States Index Scores 2012". ^ "Corruption Perceptions Index: Transparency International". Transparency.org. 1 December 2011. Retrieved 1 December 2011. ^ "Country rankings for trade, business, fiscal, monetary, financial, labor and investment freedoms". ^ "Global Peace Index 2012". Vision of Humanity. June 2012. Retrieved 13 June 2012. ^ "Press freedom index 2011-2012". RSF.org. Retrieved 12 May 2012. ^ "Democracy Index 2011" (PDF). The Economist. Retrieved 14 May 2012. ^ Gini Index obtained from: "DISTRIBUTION OF FAMILY INCOME – GINI INDEX". ^ GDP (PPP) and GDP (PPP) per capita obtained from: "Somalia". ^ Area obtained from: "Statistical Yearbook for Southern Sudan 2010". Southern Sudan Centre for Census, Statistics and Evaluation. Retrieved 1 June 2012. ^ GDP (PPP) and GDP (PPP) per capita obtained from: "World Economic Outlook Database, October 2012". ^ Population obtained from: "Western Sahara – 2011". ^ Area, GDP (PPP) and GDP (PPP) per capita obtained from: "Western Sahara". a Data refer to 2009.
b Data refer to 2006.
c Data refer to 2010.
e Data refer to 2007.
g Excludes Djibouti, Libya, Somalia and Western Sahara. The African Union has adopted a new anthem, Let Us All Unite and Celebrate Together, and has the chorus O sons and daughters of Africa, flesh of the sun and flesh of the sky, Let us make Africa the tree of life. The historical foundations of the African Union originated in the African Economic Community in 1981. Critics argued that the OAU in particular did little to protect the rights and liberties of African citizens from their own political leaders, often dubbing it the "Dictators' Club". The individual member states of the African Union coordinate foreign policy through this agency, in addition to conducting their own permanent observer at the United Nations General Assembly. Both the African Union and the United Nations work in tandem to address issues of common concerns in various areas. The African Union Mission in United Nations aspires to serve as a bridge between the two Organisations. The AU presently has an area of 29,922,059 km² (18,592,705 mi²), with 24,165 km (15,015 mi) of coastline. The vast majority of this area is on continental Africa, while the only significant territory off the mainland is the island of Madagascar (the world's fourth largest), accounting for slightly less than 2% of the total. Member states of the African Union cover almost the entirety of continental Africa and several off-shore islands. 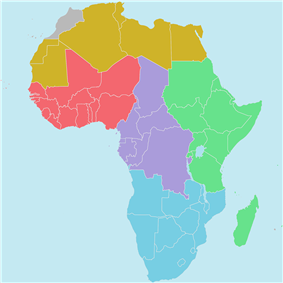 Consequently, the geography of the African Union is wildly diverse, including the world's largest hot desert (the Sahara), huge jungles and savannas, and the world's longest river (the Nile). Founded in 2001 under the auspices of the AU, the African Academy of Languages promotes the usage and perpetuation of African languages among African people. The AU declared 2006 the Year of African Languages. According to the Constitutive Act of the African Union, its working languages are Arabic, English, French and Portuguese, and African languages "if possible". A protocol amending the Constitutive Act, adopted in 2003 but as of 2014 not in force, would add Spanish, Swahili and "any other African language" and term all six "official" (rather than "working") languages of the African Union. The Executive Council shall determine the process and practical modalities for the use of official languages as working languages. From the early 1990s up until 2012, Somalia was without a functioning central government. A peace agreement aimed at ending the civil war that broke out following the collapse of the Siad Barre regime was signed in 2006 after many years of peace talks. However, the new government was almost immediately threatened by further violence. To temporarily shore up the government's military base, starting in March 2007, AU soldiers began arriving in Mogadishu as part of a peacekeeping force that was intended by the AU to eventually be 8,000 strong. Eritrea recalled its ambassadors to the African Union on 20 November 2009 after the African Union called on the United Nations Security Council to impose sanctions on them due to their alleged support of Somali Islamists attempting to topple the Transitional Federal Government of Somalia, the internationally recognised government of Somalia which holds Somalia's seat on the African Union. On 22 December 2009, the Security Council passed UNSCR 1907, which imposed an arms embargo on Eritrea, travel bans on Eritrean leaders, and asset freezes on Eritrean officials. Eritrea strongly criticised the resolution. In January 2011, Eritrea reestablished their mission to the AU in Addis Ababa. In response to the ongoing Darfur conflict in Sudan, the AU has deployed 7,000 peacekeepers, many from Rwanda and Nigeria, to Darfur. While a donor's conference in Addis Ababa in 2005 helped raise funds to sustain the peacekeepers through that year and into 2006, in July 2006 the AU said it would pull out at the end of September when its mandate expires. Critics of the AU peacekeepers, including Dr. Eric Reeves, have said these forces are largely ineffective due to lack of funds, personnel, and expertise. Monitoring an area roughly the size of France has made it even more difficult to sustain an effective mission. In June 2006, the United States Congress appropriated US$173 million for the AU force. Some, such as the Genocide Intervention Network, have called for United Nations (UN) or NATO intervention to augment and/or replace the AU peacekeepers. The UN has considered deploying a force, though it would not likely enter the country until at least October 2007. The under-funded and badly equipped AU mission was set to expire on 31 December 2006 but was extended to 30 June 2007 and merged with the United Nations African Union Mission in Darfur in October 2007. In July 2009 the African Union ceased cooperation with the International Criminal Court, refusing to recognise the international arrest warrant it had issued against Sudan's leader, Omar al-Bashir, who was indicted in 2008 for War crimes. The founding treaty of the AU also called for the establishment of the African Peace and Security Architecture (APSA), including the African Standby Force (ASF), which is to be deployed in emergencies. That means, in cases of genocide or other serious human-rights violations, an ASF mission can be launched even against the wishes of the government of the country concerned, as long as it is approved by the AU General Assembly. In the past AU peacekeeping missions, the concept was not yet applied, forces had to be mobilised from member states. The AU is planning on putting the concept into practise by 2015 the earliest. Since it first met in 2004, the PSC has been active in relation to the crises in Darfur, Comoros, Somalia, Democratic Republic of Congo, Burundi, Côte d'Ivoire and other countries. It has adopted resolutions creating the AU peacekeeping operations in Somalia and Darfur, and imposing sanctions against persons undermining peace and security (such as travel bans and asset freezes against the leaders of the rebellion in Comoros). The Council is in the process of overseeing the establishment of a "standby force" to serve as a permanent African peacekeeping force., Institute for Security Studies, South Africa, March 2008. One of the objectives of the AU is to "promote peace, security, and stability on the continent". Among its principles is 'Peaceful resolution of conflicts among Member States of the Union through such appropriate means as may be decided upon by the Assembly'. The primary body charged with implementing these objectives and principles is the Peace and Security Council. The PSC has the power, among other things, to authorise peace support missions, to impose sanctions in case of unconstitutional change of government, and to "take initiatives and action it deems appropriate" in response to potential or actual conflicts. The PSC is a decision-making body in its own right, and its decisions are binding on member states. On 20 September, the African Union officially recognised the National Transitional Council as the legitimate representative of Libya. One of the most serious issues to face Africa is not a dispute between nations, but rather the rapid spread of HIV and the AIDS pandemic. Sub-Saharan Africa, especially southern Africa, is by far the most affected area in the world, and the infection is now starting to claim lives by the millions. While the measurement of HIV prevalence rates has proved methodologically challenging, more than 20% of the sexually active population of many countries of southern Africa may be infected, with South Africa, Botswana, Kenya, Namibia, and Zimbabwe all expected to have a decrease in life expectancy by an average of 6.5 years. The effects on South Africa, which constitutes 30% of the AU's economy, threatens to significantly stunt GDP growth, and thus internal and external trade for the continent. In 2006, the AU decided to create a Committee "to consider the implementation of a rotation system between the regions" in relation to the presidency. Controversy arose at the 2006 summit when Sudan announced its candidacy for the AU's chairmanship, as a representative of the East African region. Several member states refused to support Sudan because of tensions over Darfur (see also below). Sudan ultimately withdrew its candidacy and President Denis Sassou-Nguesso of the Republic of the Congo was elected to a one-year term. At the January 2007 summit, Sassou-Nguesso was replaced by President John Agyekum Kufuor of Ghana, despite another attempt by Sudan to gain the chair. 2007 was the 50th anniversary of Ghana's independence, a symbolic moment for the country to hold the chair of the AU—and to host the mid-year summit at which the proposed Union Government was also discussed. In January 2008, President Jakaya Kikwete of Tanzania took over as chair, representing the East African region and thus apparently ending Sudan's attempt to become chair—at least till the rotation returns to East Africa. The current chair is Benin. The Constitutive Act of the AU declares that it shall "invite and encourage the full participation of the African diaspora as an important part of our Continent, in the building of the African Union". The African Union Government has defined the African diaspora as "consisting of people of African origin living outside the continent, irrespective of their citizenship and nationality and who are willing to contribute to the development of the continent and the building of the African Union". The 2013 Special African Union summit was called in regards to: “Africa’s relationship with the ICC.” This was in regards to the ICC's non-adherence to AU calls to drop certain chargers against sitting leaders and that it was disproportionally targeting Africans. The African Commission on Human and Peoples' Rights, in existence since 1986, is established under the African Charter on Human and Peoples' Rights (the African Charter) rather than the Constitutive Act of the African Union. It is the premier African human rights body, with responsibility for monitoring and promoting compliance with the African Charter. The African Court on Human and Peoples' Rights was established in 2006 to supplement the work of the Commission, following the entry into force of a protocol to the African Charter providing for its creation. It is planned that the African Court on Human and Peoples' Rights will be merged with the African Court of Justice (see above). Composed of ministers designated by the governments of member states. It decides on matters such as foreign trade, social security, food, agriculture and communications, is accountable to the Assembly, and prepares material for the Assembly to discuss and approve. The Constitutive Act provides for a Court of Justice to rule on disputes over interpretation of AU treaties. A protocol to set up the Court of Justice was adopted in 2003 and entered into force in 2009. It is likely to be superseded by a protocol creating a Court of Justice and Human Rights, which will incorporate the already established African Court of Justice and Human and Peoples' Rights (see below) and have two chambers—one for general legal matters and one for rulings on the human rights treaties. Composed of heads of state and heads of government of AU states, the Assembly is currently the supreme governing body of the African Union. It is gradually devolving some of its decision-making powers to the Pan African Parliament. It meets once a year and makes its decisions by consensus or by a two-thirds majority. The current chair of the AU is Mauritanian President Mohamed Ould Abdel Aziz. To become the highest legislative body of the African Union. The seat of the PAP is at Midrand, South Africa. The Parliament is composed of 265 elected representatives from all 54 AU states, and intended to provide popular and civil-society participation in the processes of democratic governance. Its president is the Hon. Prince Bethel Nnaemeka Amadi, Esq. of Nigeria. Haiti – At the 18th AU summit in Addis Ababa on 2 February 2012, Haiti obtained Member Observer status and thereafter submitted a formal request to become an Associate Member. Kazakhstan – On 14 November 2013, Kazakhstan obtained Member Observer status after the appropriate treaties were ratified in May 2013. Foreign Minister Erlan Idrisov became the Permanent Representative of the Republic of Kazakhstan in the African Union. Latvia – Observer state to the African Union since 2012. Serbia – country has Member Observer status in African Union and Serbian Foreign Ministers Ivan Mrkić in 2012 and 2014 and Vuk Jeremić in 2011 participated in Addis Ababa Summits. Turkey – country has Member Observer status since 2005. Central African Republic – suspended after the 2012–13 Central African Republic conflict. The AU's first military intervention in a member state was the May 2003 deployment of a peacekeeping force of soldiers from South Africa, Ethiopia, and Mozambique to Burundi to oversee the implementation of the various agreements. AU troops were also deployed in Sudan for peacekeeping in the Darfur conflict, before the mission was handed over to the United Nations on 1 January 2008 UNAMID. The AU has also sent a peacekeeping mission to Somalia, of which the peacekeeping troops are from Uganda and Burundi. The AU covers the entire continent except for Morocco and several territories held by Spain, France, Portugal and the United Kingdom. Morocco is not a member because its government opposes the membership of Western Sahara as the Sahrawi Arab Democratic Republic. However, Morocco has a special status within the AU and benefits from the services available to all AU states from the institutions of the AU, such as the African Development Bank. Moroccan delegates also participate at important AU functions, and negotiations continue to try to resolve the conflict with the Polisario Front in Tindouf, Algeria and the parts of Western Sahara.